Villa Marguerite is a single-family house, outside of the resort. The house is located at a small hamlet, 3 km from Bedoin. It is a 4-room house for 5 persons. There are 3 bedrooms, furnished terrace with BBQ possibilities, a bathroom, a living/dining room. Kitchen is equipped with 4 hotplates, oven, dishwasher, micro wave and freezer. Extra: electric heating from 02.22.-30.05. price according to expenditure, to be paid locally. 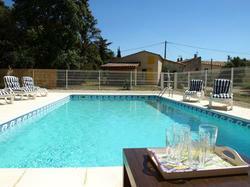 Private: grounds 1'500 m2 (fenced), swimming pool fenced (10 x 5 m, depth 150 cm, 01.05.-30.09.) with alarm. Parking is in the grounds. Nearest shops, restaurants, tennis are 3 km away. - Bed linen (Initial supply) is available for an additional cost of 10 euros. - Towels (Initial supply) are available for an additional cost of 5 euros. - Please note that the electricity fee is not included in the apartment rate and will be charged according to consumption on departure.